Most of what we take to be “investment” would be more accurately described as speculation. Speculation is not inherently wrong per se, but one should always be conscious of when one is speculating and take appropriate precautions against excess. We can distinguish between “defensive” and “aggressive” approaches to investing. – The term investment is radically overused; nearly all “investments” which people speak of are in fact, by the above definition, merely speculative. – Note that the opposition extreme can also take hold, as it did in the market crash of 1929-1932: Namely, that all market activities should be regarded as speculative. Such a categorical statement is equally as false as the opposite contention that all activities are investments. It is important to maintain a precise understanding of what investments actually are so that one does not get led astray by the misguided rhetoric of one’s time. – Graham notes that the phrase “reckless investors” is technically an oxymoron; investors, by definition, are not reckless. Yet people who call themselves “investors” are in fact speculators, and are therefore reckless indeed. – Graham notes that the overwhelming tendency of most market participants is to buy high and sell low: a perfect recipe for systematic losses at all times, and the exact opposite of what is in one’s best interest. It is, however, a source of income for value investors. Speculation is not inherently ‘wrong’ or unprofitable. It is, however, often performed incorrectly–sometimes with disastrous consequences. Here is a breakdown of some best/worst practices for financial speculation. Being fully aware of when you are speculating versus when you are investing. “speculating when you think you are investing” (21). Speculating only when you have a thorough understanding of the vehicle in which you are speculating, and in a transparently recreational manner. “speculating seriously instead of as a pastime, when you lack proper knowledge and skill for it;” (21). Only risking so much money in speculation which you can afford to lose without meaningful financial, emotional, or psychological consequences for yourself or others. Imagine that you lose everything you’ve risked, and only proceed if you (and all other relevant persons) can genuinely accept that outcome without meaningful reservations. “risking more money in speculation than you can afford to lose” (21). Keeping your speculative activities in a separate brokerage account. This helps ensure that one will not begin to conflate speculation with investment. Managing your speculative activities and your genuine investments in the same account. This can lead to fuzzy decision making owing to the conflation of investment versus speculation (21). Never committing more money to a speculative activity simply because it is appreciating in price; rather, this is precisely the context in which one should seriously consider exiting that activity for a profit. Committing more money to said activity on the grounds that its price is appreciating. Doing so likely constitutes buying high, and therefore likely foreshadows selling low in the future (22). Results to Be Expected by the Defensive Investor (22). “We recommended that the investor divide his holdings between high-grade bonds and leading common stocks; that the proportion held in bonds be never less than 25% or more than 75%, with the converse being necessarily true for the common-stock component; that his simplest choice would be to maintain a 50-50 proportion between the two, with adjustments to restore the equality when market developments had disturbed it by, say, 5%. As an alternative policy he might choose to reduce his common-stock component to 25% “if he felt the market was dangerously high,” and conversely to advance it toward the maximum of 75% “if he felt that a decline in stock prices was making them increasingly attractive.” (22). Portfolio Rebalancing. This is a practice whereby the investor routinely (usually at a pre-determined time interval such as once per year or once every six months) “rebalances” her portfolio by selling a portion of her more “successful” investments (by which I mean, those investments which have appreciated in price over the preceding time interval) and using the proceeds to purchase shares of her “less successful” investments. The objective of these transactions is to “rebalance” the portfolio such that the 50-50 division between stocks and bonds (as in our example above; other pre-determined rations could also be used, as Graham explains in the above paragraph) is maintained. Understanding Risk. One of the fundamental errors which market participants commit is to associate high market prices with decreased risk. This is in fact the opposite of the truth: high prices indicate that demand for the assets in question is already high, and that the probability of increased demand in the future is therefore lower than usual. Conversely, this means that the price of stocks (which are moved by the demand for stocks) has an above-average probability of declining in the future. Therefore, the logical assessment is to associate above-average prices with above-average risk; not the other way around. Buying Low and Selling High. 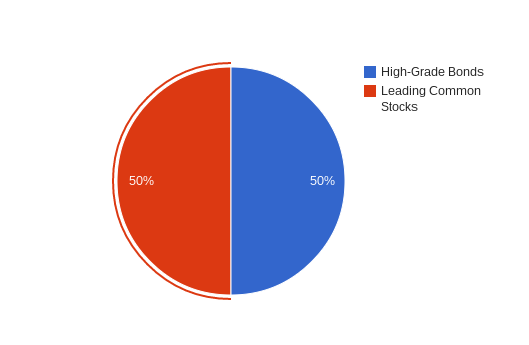 The beauty of the portfolio rebalancing method is that, if obeyed diligently, it forces the investor to buy securities when their price is (relatively) low, and to sell them when their price is (relatively) high. This, of course, is a recipe for success. “…in an astonishingly large proportion of the trading in common stocks, those engaged therein don’t appear to know—in polite terms—one part of their anatomy from another.”  His point is a) don’t be one of them, and b) learn to profit from their mistakes. Graham notes that “a good part of [his] own operations” consisted of buying bargain-issue securities which are defined as those companies which are “selling at less than their share in the net current assets (working capital alone), not counting the plant account and other assets, and after deducting all liabilities ahead of the stock.” Another way of phrasing this is that the companies’ stocks were trading at below liquidation value. Graham asserts that this would still be a good approach to investing were it not for the fact that such companies, at his time of writing, had become quite rare. Subject to qualitative analysis, however, such companies are worth considering in the event that they do appear. Footnote to page 24, written by Jason Zweig.